Mark is one of several regulars to our dive parties. He has put together another great video of diving adventures aboard the Aqua Safari around the Big Island! This dive was on August 17, 2014. A Nitrox Dive – special certification required. The increasing time between dives when I find myself approaching the dangers of “Bottom Time” withdrawal!!!! Snorkeling with MY Sister and Andy at Beach 69! Photo ©2007 Andrew Cooper behind the lens! “Bottom Time” – It is how we calculate each dive to determine how long we need to remain surfaced to allow the nitrogen to sufficiently escape from our bodies before we submerge for more Bottom Time (BT). Cumulative BT is also used to determine diver experience. Snorkeling helps to prevent withdrawal; however, after a long enough period of only getting to snorkeling depths, let alone out of the water all together, MY ‘gills’ get VERY dry! 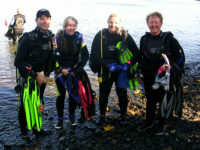 A Happy Dive Group. We located an acceptable dive site today! ©2011 Andrew Cooper behind the lens. July 31, 2011: At LOOOOONG LAST!!! I got BT again, just before the withdrawal began to get serious; and the breathing gasps for tank air started!!! 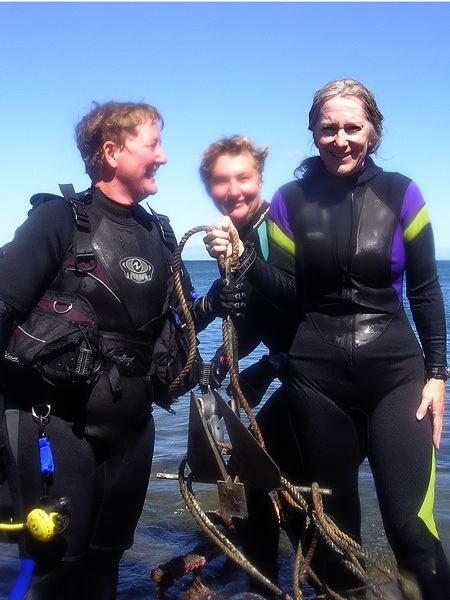 😀 Today, with strong determination, we looked at several shore sites to go diving from before we found one that was sheltered enough from the surge and wave action where we would not have more of a challenge than fun in the water. A seen from Holoholokai; but very similar to what I observed at Pine Trees. ©2011 Deborah Cooper. We had already observed an Eagle Ray or two, many Tang, a few Arc Eye Hawkfish, some Goatfish, and much more. It is little wonder that the depth escaped my scrutiny. 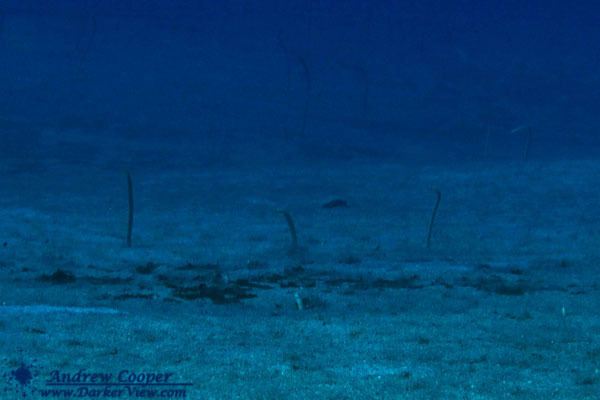 Around 85-90 feet, I saw a few Garden Eel in the distance. There was an interesting shape on the sandy bottom that was well covered by Coral Colony, and it looked like it had once been a wood transport pallet. Pine Trees shore dive site is a strong rival to Puako End-Of-Road, my favorite dive site on the Big Island; and a dive site we frequent regularly. 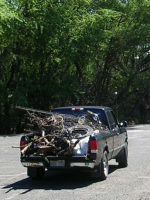 Pine Trees will receive more attention from us in the future. In this one dive, we barely broke the water surface tension on the discoveries that are available. Other than the dive mentioned here, I am having trouble remembering when my last BT Infusion was done! I know that A Darker View has posted something about this dive and some of the photos that he took, too; but I will not dare to assume when these items were scheduled to post since he has so many articles scheduled ahead in his “Drafts”. This Rubbish did not Soil my Dive! 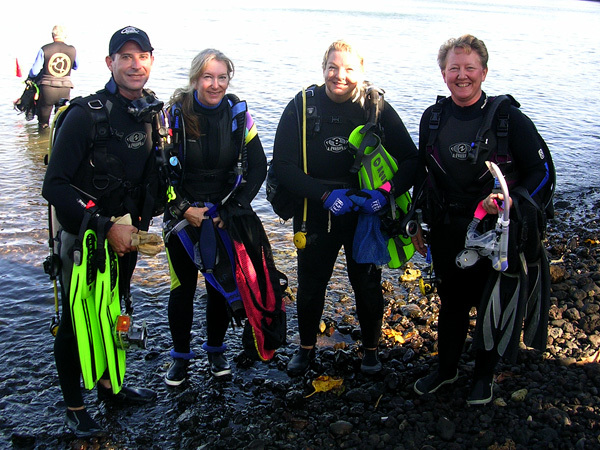 One Small Group of Dive Buddies: Dave, Lori, Joy, and Deb. A few of the many that turned out to support the efforts. Both Andy and I joined in on last year’s effort on September 12; but, “sadly”, Andy had to work on the Mountain this year on the scheduled date. This year, while he was on Mauna Kea Summit, I went shore diving bringing in rubbish of all types and taking pictures as best as I could in the murky water so near the Puako Bay shoreline. When it is now so much a Part of the Reef that it would destroy more of the coral than would be benefited, we leave it embedded. 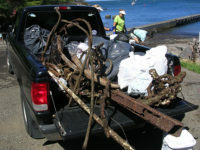 Catch of the Day: A nice sized anchor! yards of abandoned fishing line with a couple of large hooks attached, some golf balls, a few “what’s its”, and a boat anchor (Lori got her workout on that one) — and that was just what was pulled out of the water. The take for the day. The onshore team gathered up way too many cigarette butts, a rusty section of barbed wire fence with rusty posts, a dirty diaper or two, more golf balls, and a few more “what’s its”! The “what’s its” lead to some interesting speculation of what the former function was prior to becoming rusty litter :-O Much laughter ensued from the comments put forth! Don and Deb over coral at Puako. By ©2010 Andrew Cooper. Starfish Date 20100711.0900 D1: Surf Forecast called for choppy conditions on both East and West sides of Hawai’i today. We decided to go for a drive to check out Diving conditions at End of Road Puako. It was Fantastic!!!!! It was in just the right position to be sheltered from the brunt of the wind, surf and surge. Although the water wasn’t as clear as we have seen it, it was better by far than I was expecting. Almost no noticeable surge either, unless you held still enough for a few minutes and made conscious note of it. Garden Eels (Gorgasia hawaiiensis) at 80′ depth at Puako. By ©2010 Andrew Cooper. We decided to go South today, and it turned up a new specie or two of Marine life. Due to the lack of surge, I got to enjoy the dive more instead of fighting to keep my position while I was looking at one bit of coral or another. ‘Thick Cotton Ropes’ 😉 AND Summer Diving as well as Stout Moray — posted by Darkerview.com…. 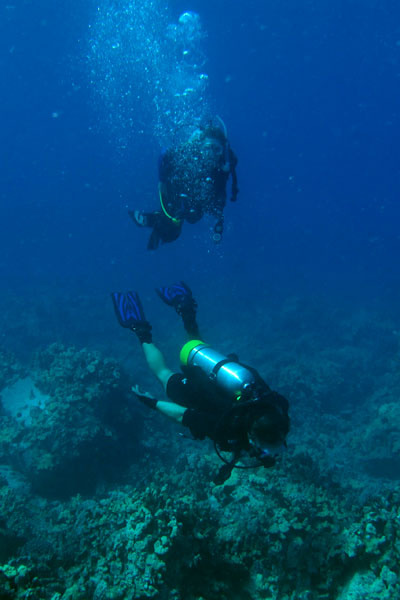 Deb and Andy exploring the reef at Puako, photo ©2010 by Kirk Tateishi. Crown-of-Thorns Starfish (Acanthaster planci) at 45 feet off of Black Point, Kohala. 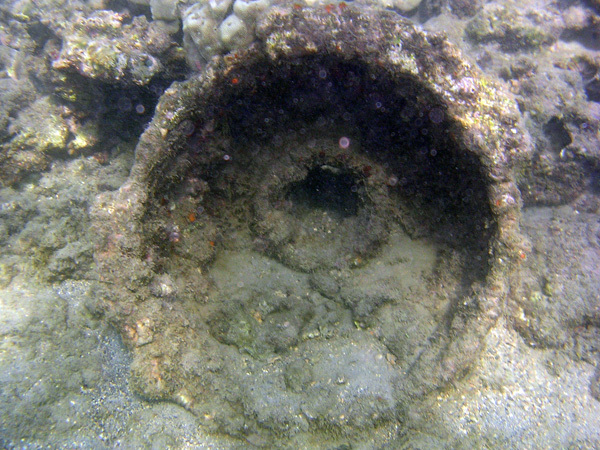 Another new dive spot that we checked out on November 14, 2009. The Old Kona Airport State Recreation Area. 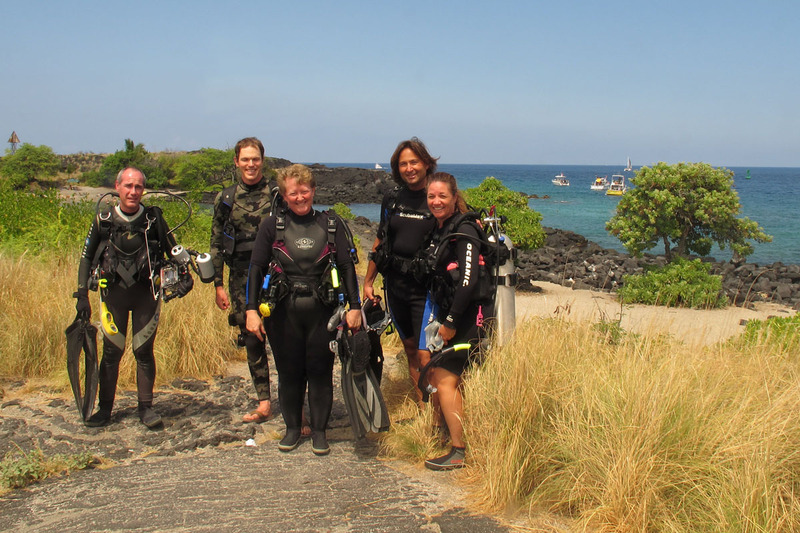 We met several friends from Keck that have formed our usual dive group at the end of the old runway (I am sure that we would welcome more divers to go with us). I scoped out the available facilities and noted fresh water showers as well as restrooms that were very conveniently close to the point of the beach where we chose to make our entry. A wonderfully unexpected surprise. 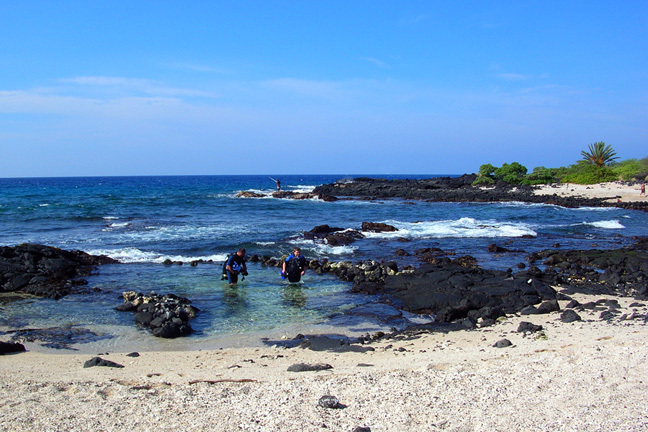 Our Shore Diving Entry Point at Old Kona Airport State Recreation Area. There are two detailed postings at Darkerview.com: “Diving the Old Kona Airport” and “Diving with the Canon G11” (These links are awaiting repair by Darkerview) including some great photos from the dive. I will try not to reiterate too many of the ones Andy posted. I will certainly post some photos that he has not posted 😉 The entry was a bit slow and cautious with a very rock covered ‘floor’; but there was little to no sand around to get in the gear before we entered the water. Soft Coral at Old Kona Airport Dive Site. Still searching for accurate ID. 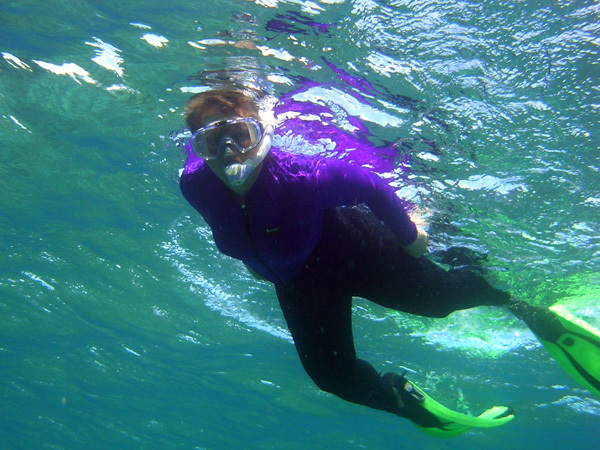 The strong surge made it difficult to put on my fins; but with Andy’s help, I was geared up and we were on our way. 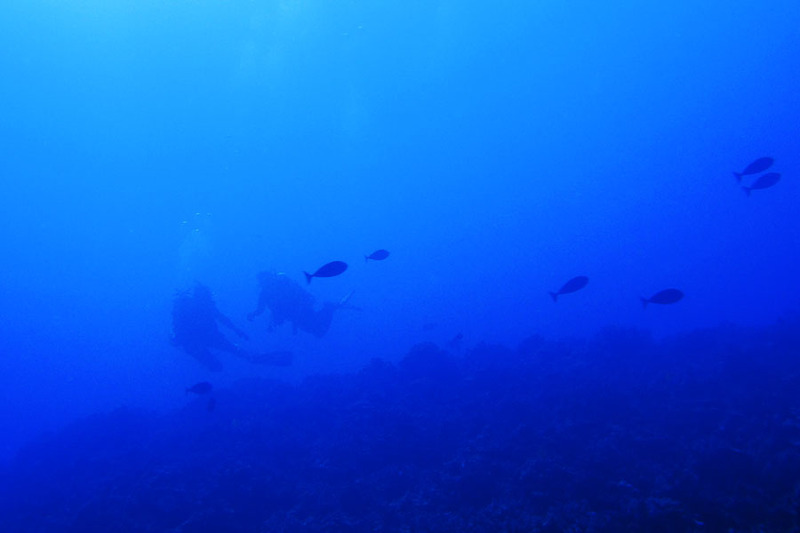 Now we traverse the strong waves while surface swimming to the part of the reef where we wanted to start the dive. Once we submerged, it was very nice and reasonably calm. Only a hint of the strong surge that was on the surface. The water temperature was brisk when we first got our feet wet; and when we reached the bottom, it was warm enough for much longer than I had anticipated. This made for a long (66 minutes), very enjoyable dive! The Coral structures were very intriguing as we noted soft corals and corals in shapes like mushrooms, and huts as well as the occasional large piece that resembled dinner vegetables! I will be happy to go diving here again! A Disappearing Wrasse (Pseudocheilinus evanidus) at the Old Kona Airport State Recreation Area. Numerous fish of most all of the usual suspects! There were Yellow Tang, Trumpetfish, Hawaiian Dasyllus, Long-nose Butterflyfish, Arc-eye Hawkfish, schools of Goatfish, Lei (Whiteline) Triggerfish, Parrotfish, Moorish Idol [and/or Pennant Butterflyfish], and several that I saw but did not make specific note of such as the Disappearing Wrasse (Pseudocheilinus evanidus). The photos will help with some of the ID’s and they often surprise me with what I capture along with the intended target. 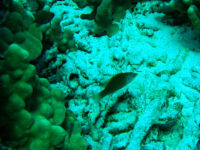 Oddly enough I only saw one Moray Eel (a Whitemouth Moray) that Andy pointed out to me so that I could photograph it. He also brought my attention to the Nudibranch that he located in the sand in a Coral ‘valley’ and I also photographed it. 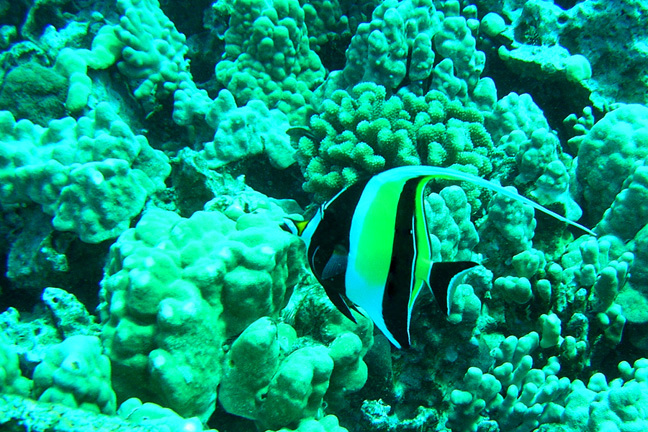 Moorish Idol (Zanclus cornutus) at Old Kona Airport Dive Site. 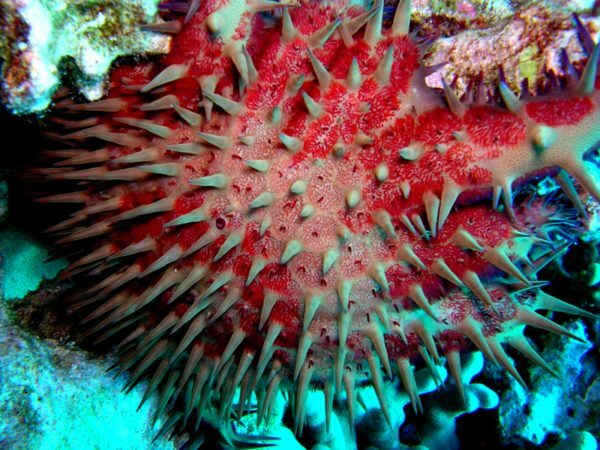 On The Reef from Andrew Cooper on Vimeo. 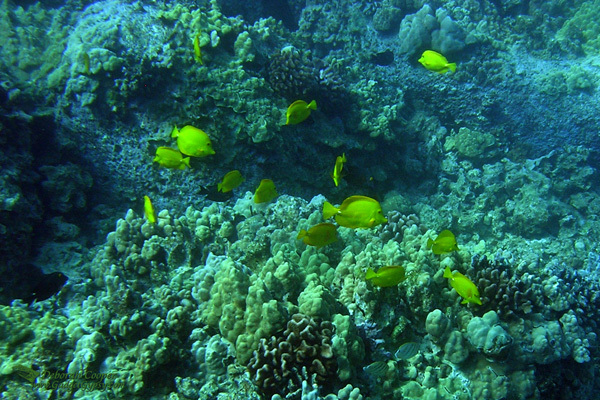 Exploring the reefs of the Island of Hawai'i. A small sample of the creatures that inhabit a fascinating ecosystem. A little video, still photos and some appropriate music to complete the scene. This is a substantial revision of an older version, now in full HD and with new photographic material.